THIS is a waste recycling centre right on my doorstep. Literally! This is how my backyard could look if I had all the bins Crewe and Nantwich Borough Council would like me - and my fellow residents - to have. O.K. There is no such centre. I have been "playing around" with the image. More on that space for glass in a moment. The grey bin (the council calls it silver!) was delivered recently and comes into use in the week beginning February 27th. It is meant to take "all paper and cardboard you cannot put into the paper banks or the green bin . . . e.g. cereal boxes, brown packing boxes, corrugated card, white and yellow telephone directories and other low grade paper not suitable for recycling into newspaper." Quite a range. Up to now, the types of paper listed above have had to be thrown away with the rest of the general household waste in the black bin. (There was a time when that was called a grey bin). The council waste recycling people couldn't handle cardboard, etc. I have been recycling as much waste as I could for years now - using the waste recycling centres at the local supermarkets, including newspapers until the green bin was issued. So I am not against recycling in any way. On the contrary, I think it is very important. But it isn't the plethora of bins that is the problem. In future, the black/grey bin and the grey/silver bin will only be collected on alternate weeks. This is fine for anyone who hasn't so far been into recycling. Half of what used to go into the black/grey bin will now go into the grey/silver bin and all will be well, it is claimed. As the council leaflet said: "Because over 50% of your waste can now be recycled, your residual waste bin will not be filled up every week." A nice theory, but I have found that - even after recycling as much material as I could - there have been weeks when I have more or less filled the black/grey bin with other household waste in one week. I don't know where it comes from . . . ! So what is going to happen every other week, when only the cardboard, etc, will be collected? We are assured there will be no problem with household/food waste sitting in the appropriate bin for two weeks - what, not even in a hot summer? - but it is more a case of where will I put the second week's waste? waste" (that is rubbish in plastic bags left next to the bin) and - they remind us - the bin lid must be closed. (This, apparently, is to keep the smells inside the bin.) Excess waste cannot be put in the bin above the lid level with the lid open. True, since I am writing this on February 15th, I haven't had experience of how it will work. Perhaps I will be proved wrong and my waste will fill my appropriate bin and no more. Maybe I'll have egg on my face. Still, as long as the egg isn't contaminating the inside of the bin . . . ! People living in houses and flats unsuitable for another bin are assured they will be "offered alternatives such a boxes, bags or communal containers." But wait a minute . . . If someone in a house or flat puts out a plastic bag next to a bin, how will the refuse disposal operatives (remember that job description!) know it belongs to someone in an "unsuitable" house or flat and not to a resident trying to get away with disposing extra waste? Possibly because the latter wouldn't have an appropriate bag, I suppose. You see, the RDOs can refuse (no pun intended) to take "side waste" and contaminated rubbish - that's cardboard, for instance, which has been stained with "baked bean sauce" (I'm quoting now!) which has trickled from a tin that the resident didn't rinse out! And for anyone complaining that rinsing out tins will use more water, the ever-helpful recycling team suggest the use of "old washing up water" which will not be costly or waste resources. I am not the only one with problems over the bins. One lady has threatened to write to the Minister of State for Climate Change and Environment, and a town councillor has had his say. Readers of the local newspapers have also thrown in their two-penn'orth. What, I am sure you are wondering, happens about people who fail to toe the line? Well, an earlier leaflet said: "We recommend that you co-operate with the new collection service and need to advise you that householders who do not comply may be prosecuted." Those words do not appear in a later leaflet that came with the new bin. picking up on some comments made in the press - including the threat of prosecution. She wrote: "Over 15,000 householders are successfully using the new scheme with absolutely no need to invoke these powers. "However, the council has a duty to inform householders of any change to their refuse collection service and we are obliged to inform residents that they can be prosecuted for deliberate non-compliance. "We apologise if some people feel we have been heavy handed." Penelope also explains why only plastic bottles can be accepted. "Nobody in the UK will take (other types of plastic) from us." She refutes that residents are doing the council's job in sorting the refuse. "We cannot come into the kitchen and help," she says. The council isn't making money from recycling - "in fact, recycling costs us money". The oddest denial, however, is: "Blue bins - There is absolutely no truth to this. There is also no intention to issue any further wheeled bins. The maximum will be the four already available." Really, Penelope? In the leaflet that came with the bins, someone - explaining how glass could break in the silver/grey bins, with glass splinters contaminating the cardboard - wrote: "We hope we can soon introduce a collection service for glass. Until then, please use the glass banks." O.K. No mention of a bin. Blue or otherwise. That's good, because with the amount of glass I use, and throw out, wouldn't fill a bin in a whole year! Presumably we will get boxes or similar for the glass. 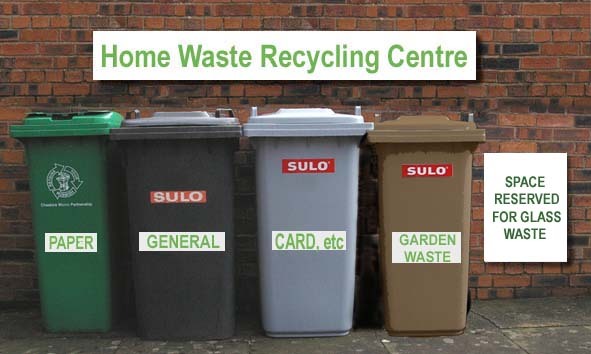 Another point: With so much waste going into the new "At Home" recycling centres, with there be a need for centres at supermarkets or the council-operated ones? MY worries about having too much general rubbish in my black/grey bin, because it is being emptied only once a fortnight, are proving unfounded - so far. Despite having a little " clear out" - a pre-Spring clean - I still managed to close the lid on the general bin after filling it for two weeks. And now it looks as though I am going to go for a full month and not fill the recycling (grey/silver) bin. But it early days yet.